MGB Insurance Brokers Limited is a wholesale broker, with a specialism in professional indemnity (PI) insurance and is BIBA accredited for its member PI facility provided in conjunction with Manchester Underwriting Management Limited and CGPA Europe. At MGB, members will receive direct access to account handlers who evaluate each risk individually and provide clear, pertinent feedback when arranging insurance protection. 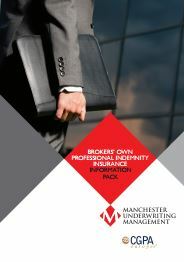 Manchester Underwriting Management (MUM) is an MGA also specialising in PI and other professional risks. Our insurer partner, CGPA Europe, is A- rated by Standard and Poor’s and is a subsidiary of CGPA who have specialised in writing almost nothing but PI for insurance intermediaries for more than 85 years. Our BIBA accredited PI product, exclusive to BIBA members, is specifically designed to provide practical, real protection to brokers. This is a premium product where you can benefit from our commitment to providing support to avoid problems and potential claims as well as broad cover when it is needed. • Loss of client cover – Up to £25,000 if you record a loss in your Profit and Loss accounts entirely due to the loss of a client following the payment of a PI claim. Mills & Reeve, a major UK law firm, provide an early claims advice service which will operate if an insurer has reserved its rights or declined cover for one of your client’s claims, free of charge. They will help you to assess whether the insurer’s decision can be legitimately challenged and, if it can, to provide guidance about the approach you might take to protect your client’s position.